In many ways using the Canon PowerShot D10 is much like using any other Canon point-and-shoot compact. Ignore the rather obvious external design differences, and you'll find that the D10 offers the usual blend of intuitive handling, sensible design and largely dependable image quality. It shares a lot in common with its PowerShot and IXUS / Digital Elph relatives, making it easy to pick-up and use if you've ever owned a recent Canon compact. A few corners have been cut to accommodate the D10's almost bomb-proof protective features - the 3x, 35-135mm zoom lens and 2.5 inch LCD screen are rather hum-drum for a 2009 camera. On a more positive note, though, the lens is quite fast, making it well-suited to underwater use, and the screen is bright enough to be clearly seen in all but the murkiest of conditions. As with the Olympus mju Tough 8000 that we recently reviewed, the Canon PowerShot D10 only really makes sense if you're going to take full advantage of its water-, shock-, freeze- and dust-proof qualities. Viewed in that light, the $329.99 / £379.00 / €449.00 price-tag suddenly doesn't seem quite so steep. 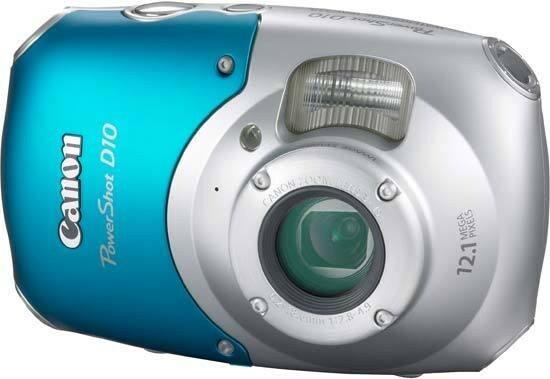 A decent compact camera with a separate underwater housing would cost as much, if not more, than the PowerShot D10, and you wouldn't get the other benefits or convenience either. The D10 will mostly appeal to the more active user, but is still a good bet simply for taking to the beach this summer.